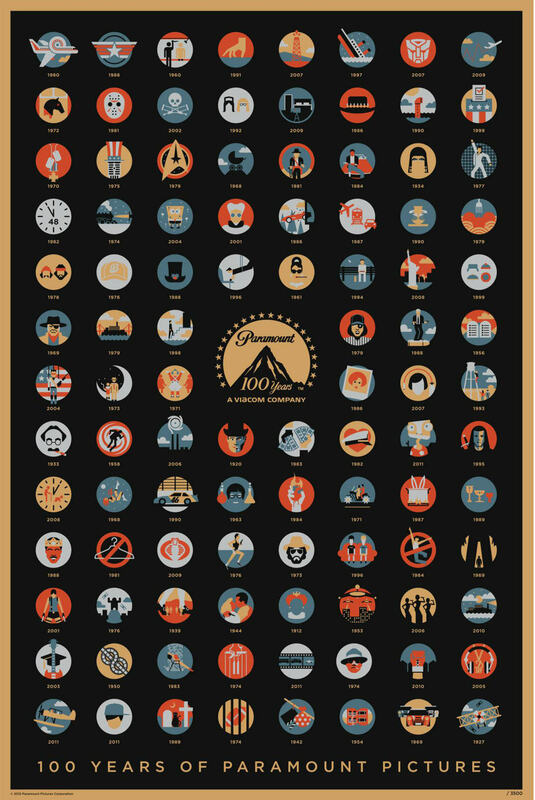 What a delightful visual treat this 100 Years of Paramount Pictures poster is: celebrating Paramount’s 100th Anniversary in glorious technicoloured icons. Designed by L.A.’s Gallery 1988. The poster consists of sweet sweet icons that represent Paramount’s biggest movie releases, so the challenge is to see how many films you can name from those delicious icons. Would love to know more about the creative process behind this, and how long it took as well, as an idea on how many ideas for each movie icon were tossed around. K Found via 100 Years of Paramount Pictures | Cartoon Brew.